Display lightweight materials on our white mat board panels. Both sides are covered with clear Multiglas™ to prevent damage to your materials and keep your display looking its best. When ordering, specify your frame color preference-light gray or beige-using the pull-down menu above. 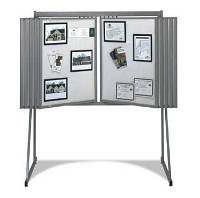 10-Panel Mat Board Floor Display - 24" x 36"
10-Panel Mat Board Floor Display - 30" x 40"
20-Panel Mat Board Floor Display - 24" x 36"
20-Panel Mat Board Floor Display - 30" x 40"
20-Panel Mat Board Floor Display - 40" x 48"